Is there a better alternative to xCommander? Is xCommander really the best app in Home Inventory category? 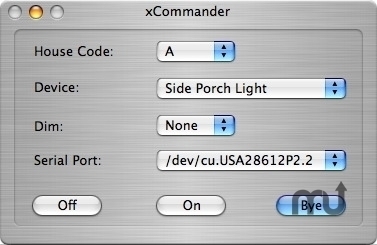 Will xCommander work good on macOS 10.13.4? xCommander is a simple interface for the X-10 Model CP290 Computer Interface. Access all 256 devices. On/Off/Dim functions. Does not deal with events stored in the CP290 memory (use xMaster to manage CP290 events). Access a CP290 over a local network, when used with xStation. xCommander needs a review. Be the first to review this app and get the discussion started! xCommander needs a rating. Be the first to rate this app and get the discussion started!